This year marks the one hundredth anniversary of the publication of Freud’s essay ‘On Narcissism’ – one hundred years in which the concept of narcissism has been a central focus for successive generations of psychoanalysts. Yet in the public mind, misperceptions persist. As the psychoanalyst and writer Karen Horney was at pains to stress, it is not narcissistic for a person to value a quality in himself which he actually possesses, or to want to be admired and valued by others. The problem arises because narcissists love and admire themselves for qualities for which there is no adequate foundation. Rather than being marked by realistic by self-worth, narcissism is characterised by unrealistic self-inflation, masking the absence of a mature sense of self. The myth of Narcissus conveys this core feature of narcissistic personality disorder powerfully. 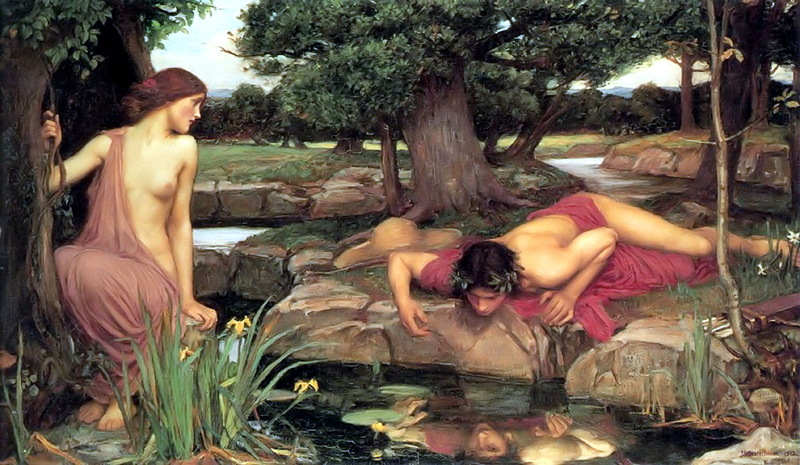 The myth tells us how the handsome Narcissus was doted on by the nymph Echo, whom he rejected. In retaliation, the gods decided to punish Narcissus by making him fall in love with his own reflection in a mountain pool. Every time Narcissus reached out to this image of perfection, however, the image fragmented, causing him to die of sadness. The myth of Narcissus is a warning of the dire consequences that result from the failure to embrace a strong sense of the self – Narcissus after all never recognised the handsome reflection as being his own. The characteristics of narcissistic personality disorder are well known: a grandiose sense of self-importance or uniqueness; exhibitionistic need for constant attention and admiration; a lack of empathy and inability to recognise how others feel; disregard for the personal integrity and rights of others; and relationships marked by a sense of entitlement and the exploitation of others. These characteristics are now understood by psychoanalysts as a failure of the psyche to mature beyond the primitive fragmentation of the childish mind. One of the leading theories on narcissistic disorder, which is based on decades of clinical observation, focuses on how our minds develop from the earliest days of infancy. In very early childhood, when the baby’s mind and brain are still developing, it is thought that the baby is unable to distinguish between itself and the world around it. There is a magical omnipotent quality to the child’s experiences. She cries and is automatically enveloped in a warm soothing embrace. She is hungry, and warm milk is quickly conjured up to satisfy her need. Physical discomfort from soiled nappies is magically dispelled when the infant cries out for this to happen. In these earliest days of development, the infant’s primitive mind is unable to distinguish between itself and the outside world. She is the world, and the world responds to her every need. But life does not continue in this magical vein for long. The state of primary narcissism, as Freud called this early phase of apparent omnipotence, is disturbed as the child experiences the inevitable frustrations which happen as the child grows, and the mother withdraws from the intensity of care that was necessary in the first few weeks and months of life. Now the child’s every wish is no longer magically satisfied, and the existence of an ‘outside’ reality begins to break in. Psychoanalysts refer to this crucial period of development as the beginning of object relations. The term object relations may appear contrived, but it accurately describes the fact that the infants first relations are not only to people outside herself, but also to fragmented parts of her own developing mind. The child’s dawning, painful, realisation that external reality exists happens when the child’s mind is still a bundle of loosely interacting parts. Two of these parts, the ego and superego, are familiar to us from everyday discourse. The ego is the part of the psyche that we most readily relate to as the self. Freud described the ego as the part of the personality that enables the individual to delay immediate gratification. It weighs reality against the demands of the psyche, and acts as the locus of judgement, rationality and control. Then there is the superego. According to Freud, the child compensates for the loss of omnipotence that comes with the realisation of external reality by internalising aspects of the mother within its own psyche. This internalisation compensates for the loss in reality and provides a sense of comfort and safety. Even when the mother is physically absent, she is now there in the child’s mind. This internalised image is the superego. It plays the role of the ever present mother, guarding over the thoughts and behaviour of the child, and crucially, comes to act as the source of conscience and guilt. In the infant’s primitive mind, two other psychic parts are also present that are less well known in popular discussion – the ego ideal and the narcissistic self. The ego ideal is that part of the superego which retains a belief in the child’s omnipotence. It exerts relentless demands for grandiosity and perfection, and like a cruel circus trainer, stands ever ready to pour scorn should its unattainable standards not be met. The final part of the child’s primitive psyche is the narcissistic self. This contains the child’s drive for love and admiration, and is the source of the infant’s desire to be looked at and admired. In normal development, the narcissistic self becomes the source of healthy self esteem. In early development however, the narcissistic self has an intensity that reflects the infant’s existential need for attention and terror of rejection. Over time, and as the result of experience, the ego manages to moderate the extreme demands for perfection and omnipotence of the ego ideal and the childish exhibitionism and desperate need for acclaim of the narcissistic self. As Heinz Kohut writes, the mature personality becomes dominated by the ego, which exercises a measure of rational control, and the superego which sets realistic ideals and moderates behaviour through a healthy modicum of guilt. In other words, during the course of normal psychic development, we acquire a measure of humility, the recognition of external reality, and the acceptance that others are not here simply to serve our needs. Using this model of early child development, narcissistic personality disorder can be understood as a failure in early psychic development that leaves the mind dominated by the primitive narcissistic self and the omnipotent ego ideal. The personality of someone with narcissistic personality disorder is characterised not by the interplay of a mature ego under the realistic expectations of a healthy superego, but is instead dominated by the childish exhibitionism of the narcissistic self under the unattainable demands of the ego ideal for omnipotence and perfection. The narcissist’s highly inflated concept of themselves comes from the demands from the ego ideal for omnipotence. In response, the narcissistic self is compelled to engage in continual exhibitionism, seeking constant attention and approval. This constant need for an adoring audience belies the misperception that narcissists have little need other people. Far from being self sufficient, the adulation of others is essential for narcissists to maintain their mental stability. And that stability is precarious. Since no-one can be either perfect or omnipotent, the narcissistic self is bound to fail. And like a child whose exhibitionism has been repeatedly met with ridicule, the narcissist is constantly living in fear of humiliation and shame.This avoidance of humiliation gives narcissists their formidable energy as they pursue their grandiose goals. Others are seen not as separate individuals with equal rights as themselves, but as object to be manipulated for their own ends, and as an adoring audience whose primary role is to ensure that the entire charade is not exposed. This understanding of narcissism brings us back to the core truth in the myth of Narcissus. It is not that the narcissist is in love with himself; it is that the mature ego has never developed. Narcissus eventually died of sadness because every time he reached out to embrace himself his self image fragmented and disappeared. In reality, however, people with narcissistic personality disorder are more likely to be pursuing their grandiose dreams – at enormous expense to society – than coming to terms with their lack of substance within. This entry was posted in What are Personality Disorders? and tagged ego, ego ideal, Freud, Heinz Kohut, myth of Narcissus, Narcissistic personality disorder, narcissistic self, on narcissism, superego by Ian | disorderedworld. Bookmark the permalink. So if I read this correctly, popular discourse is wrong. When we come across a “showoff” or someone who is “self-centred” we tend to talk about the size of their “ego” and negatively look upon a “large ego”. In fact an ego is healthy? We instead should say that they have a small ego and that their “narcissistic self” and “ego ideal” are huge? That would be more accurate. A healthy ego corresponds to a positive sense of self-regard based on real attributes and achievements. While others might call someone who talks about their real achievements boastful, such behaviour is not necessarily reflective of narcissistic disorder. Hello, good to find a psychoanalysis scholar attempting to bring Psychoanalytic concepts and theories into the mainstream general public, where they are still largely misunderstood and undervalued. Unfortunately, psychoanalytic theory remains very popular mainly with the intellectual bourgeoisie, including left leaning (Masochistic) Neo-Marxists who purport to care so much about ‘the poor’ as an excuse to unconsciously enjoy suffering. Narcissism, in terms of ‘fixation’ manifests in so many ways, even though it is easy to be blinded by the light flashy variety. As I wrote in my ‘Addiction is Narcissism’ article a few years ago, being fixated on and addicted to anything, including psychoanalysis, is narcissistic.